Yaroslava Shvedova is a Kazakhstani professional tennis player of Russian descent. She has achieved a career high ranking of No. 29 as of June 21, 2010. She has won 1 WTA singles title, 3 ITF Women's Circuit singles titles and 3 doubles titles, including the 2010 Wimbledon and US Open Ladies' Doubles titles. She was taught tennis at the age of six by her father who is currently her coach. She has made one Grand Slam singles quarterfinal, at the 2010 French Open. Shvedova experienced a good run at the 2010 Sony Ericsson Open in Miami. She gained direct entry into the main draw and won a tight first round match against wildcard Ajla Tomljanović 6–7(1), 7–6(3), 7–5. She then defeated 23rd seed Sabine Lisicki in the second round after she retired whilst trailing 3–6, 1–0. 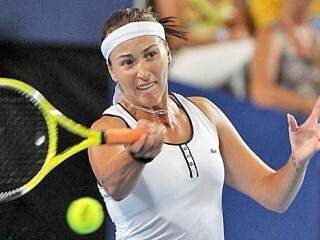 In the third round, Shvedova advanced against unseeded Andrea Petkovic by winning another close match 6–0, 5–7, 7–5. She fell to 6th seed Agnieszka Radwańska 6–1, 6–4 in the fourth round. At the 2010 Barcelona Ladies Open Shvedova defeated Anabel Medina Garrigues 6–1, 6–4 in the first round before upsetting 4th seed Maria Kirilenko 4–6, 6–2, 6–2 in the second round. Next, she defeated Iveta Benešová 6–4, 6–4, before falling to eventual tournament and 2010 French Open champion Francesca Schiavone in the semifinals. Shvedova enjoyed arguably her best career result at the 2010 French Open. There, she advanced to the quarterfinals in the Women's Singles competition. Shvedova defeated 8th seed Agnieszka Radwańska, avenging her loss to her in Miami, en route to the quarters. As the last unseeded player in the tournament, Shvedova was defeated by 4th seed Jelena Janković in the quarterfinal, 7–5, 6–4. In mixed doubles, Shvedova partnered with Julian Knowle of Austria to reach the final, beating doubles legends Cara Black and Leander Paes, the second seeds, along the way. They fell 4–6, 7–6(5), in a nailbighting final to sixth seeds Katarina Srebotnik of Slovenia and Nenad Zimonjić of Serbia. At the 2010 Wimbledon Championships, Shvedova entered the Women's Doubles competition unseeded with partner Vania King. The two began playing together at the start of the grass court season two weeks before, and were only in their third event together. In a stunning string of upsets, Shvedova and King won the tournament, beating Elena Vesnina and Vera Zvonareva 7–6(6), 6–2 in the final. The pairing they beat in the final beat Serena and Venus Williams in the quarterfinals, and Zvonareva lost in the women's singles final. Both Shvedova and King continued their good form onto the hard courts of the 2010 US Open, being seeded 6th, the team continued to win match after match before taking a spot in their second consecutive Grand Slam final, this time facing Liezel Huber and Nadia Petrova. King and Shvedova won 2–6, 6–4, 7–6(4) after the match was played over two days due to heavy rainfall. Changed nationality from Russia to Kazakhstan in 2008. View the full website biography of Yaroslava Shvedova.